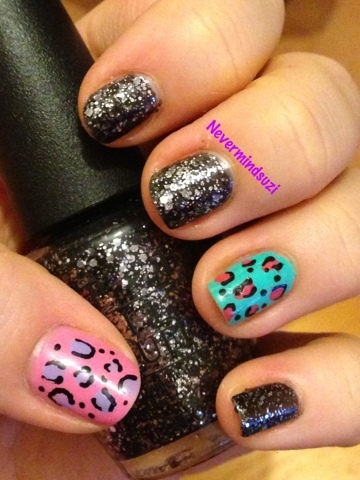 This is a bit of a mish mash mani today. I'm still sporting some leopard print on my ring and thumb from my previous "Money Smart Nail Art" post but I wanted to show you this fabulous combo I used today. OPI - Metallic 4 Life was part of the Nicki Minaj collection, though I actually forgot about it when swatching so thought I would include it now. It's a black creme full of silver glitter. The glitter really holds its own too, no sinking problems. 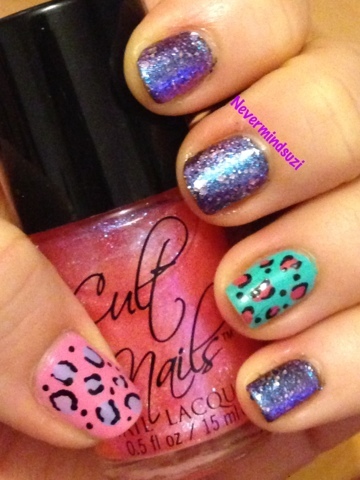 Cult Nails - Charlatan is a colour changing too coat. It looks bright pink in the bottle but when applied over Metallic 4 Life it transforms it into the most beautiful blue/pink/purple duochrome. And with the glitter is Metallic 4 Life it's got a galaxy look about it. I never thought this was going to be the end result so I'm really pleased I combined the 2. Such a gorgeous combo! I'm loving the colour combos. It looks wicked! The accent nails are super sweet!